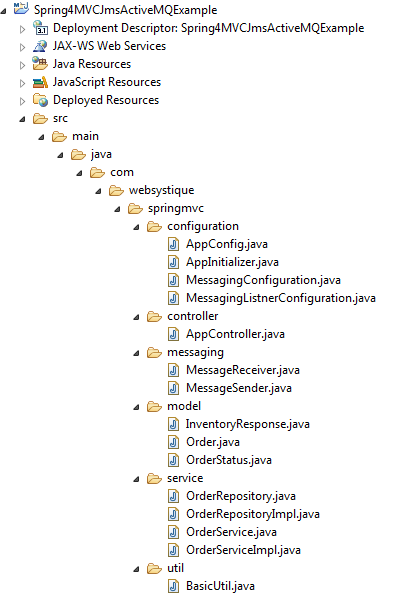 Spring provides first-class support for JMS, enabling applications integration using standard based messaging. 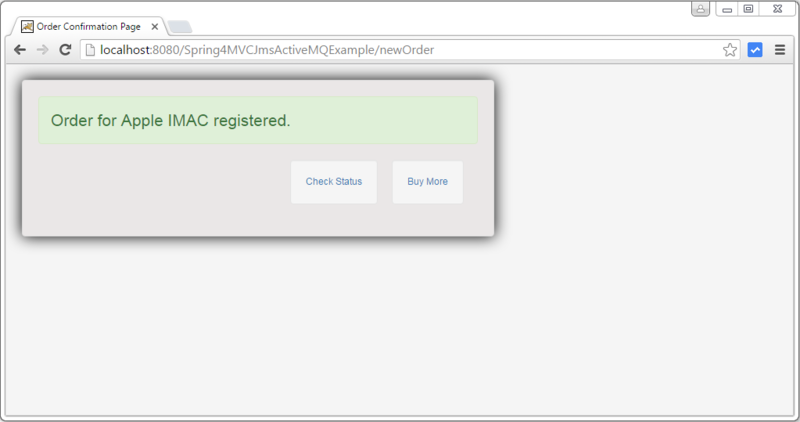 In this post, we will build Spring 4 MVC application communicating with another Spring-based application, using JMS through Apache ActiveMQ. For a general introduction on JMS itself, please refer to post Spring 4 + JMS+ActiveMQ Annoataion based Example. We will try to touch them in this post as well. Let’s get going. We have two Spring based java-applications. 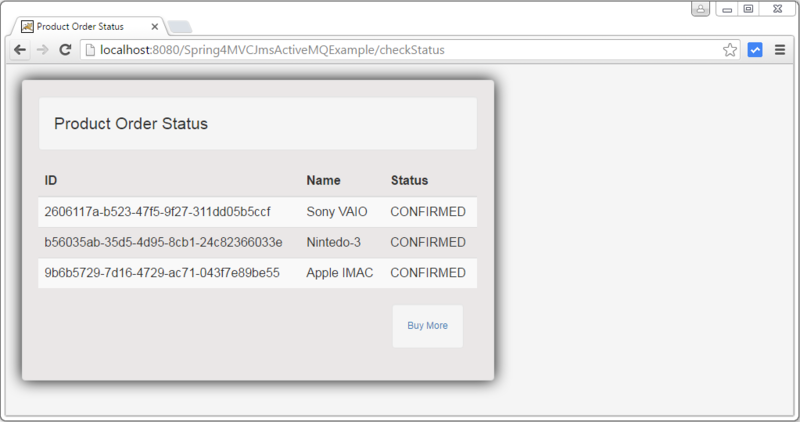 First one is a Spring MVC application [A Web-shop] where you can buy a product online. 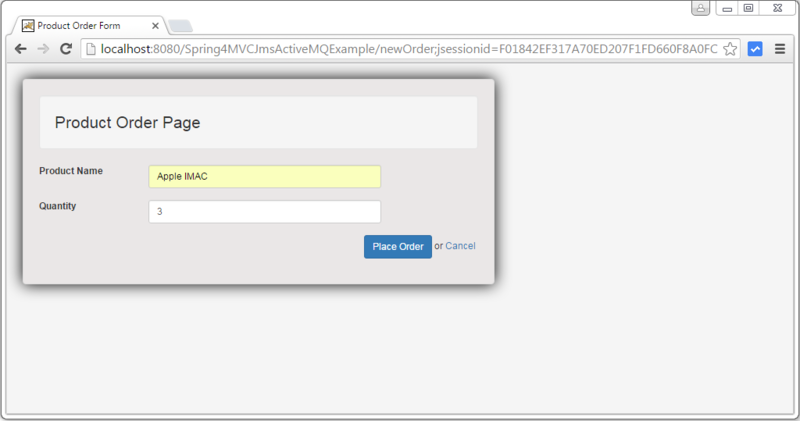 Once you have placed your order [means order status is ‘created’], Web-shop application sends this order to an Inventory application [which is a Spring MVC based application, deployed as war] using JMS queue [named as ‘order-queue’] via ActiveMQ Message broker, and configures a Listener on response queue [named as ‘order-response-queue’] to get the order confirmation from Inventory application. Inventory application, which was listing on order queue [‘order-queue’], gets the order, and process it. It then sends the confirmation on the response queue [‘order-response-queue’]. On receiving the order response, the Web-shop updates the order status in it’s repository. 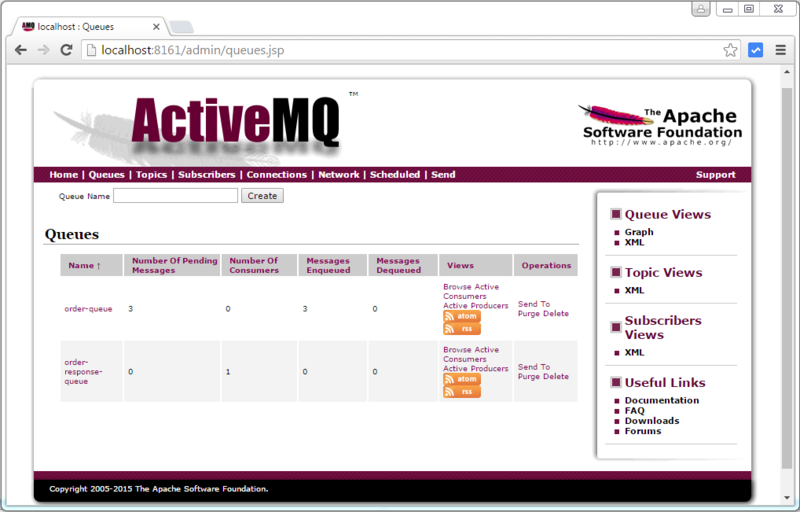 Download ActiveMQ Message Broker, unzip it, goto bin directory and start it using $ ./activemq start. You can quickly check the WebConsole [available at http://localhost:8161/admin/ with credentials admin/admin. Now, let’s start with Web-shop application. 1. ConnectionFactory : In order to connect to a Message broker (and eventually able to send receive messages), we need to configure a ConnectionFactory. ActiveMQConnectionFactory is the ConnectionFactory implementation from Apache. 2. Destination : Each JMS message sent by an application is addressed with a Destination. Destinations in JMS are like postal mailboxes where the messages are placed until someone comes to pick them up. There are two types of destination in JMS: queue and topic. Queues [point-to-point]: Queue’s are based on point-to-point messaging model where messages are sent to a queue. Each message has exactly one sender and one receiver. Message is guaranteed to be delivered to only one receiver. Topics [publish-subscribe]:Topic’s are based on publish-subscribe model where messages are sent to a topic. N subscribers can be subscribed on a topic, and when a message arrives, each will get a copy of that message. Above configurations sets up a connection factory used to connect to Message broker itself. 3. JmsTemplate : Additionally, we have configured a JmsTemplate which provides an abstraction , hiding all the complexities of JMS communication. Without JmsTemplate, you will be forced to create connections/sessions/MessageProducers/MessageConsumers and catch all the nasty exception platform may throw. 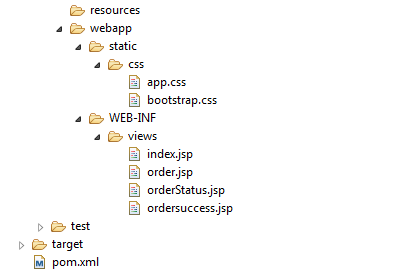 With JmsTemplate ,you get simple API’s to work with , and spring behind-the-scenes take care of all the JMS complexities. It takes care of creating a connection, obtaining a session, and finally sending [as well as synchronous receiving] of message. We will be using JmsTemplate for sending the message. Do note that JmsTemplate also provides possibilities for receiving message but that is synchronous[blocks the listening application], and usually not preferred when asynchronous communication is possible. 1. Annotate a POJO method with Spring’s very own @JmsListener. 2. Configure a message-listener-container [ with JmsListenerContainerFactory] : which listens on a destination [can be the one used with @JmsListener] and when any message arrives on this destination, it retrieved that message and passes to the bean annotated with @JmsListener for that destination. 3. Use @EnableJms which enables detection of JmsListener annotations on any Spring-managed bean in the container. DefaultJmsListenerContainerFactory is a JmsListenerContainerFactory implementation to build a regular DefaultMessageListenerContainer. You can configure several properties. At the very least, it needs a connection factory. Additionally, we have specified the concurrency [max number of concurrent users/consumers] using setConcurrency(“lowwe-upper”). You can also use setConcurrency(“upper”) which means lower will be 1. Shown below is the @JmsListener bean. And finally, a Service for sending the message using JmsTemplate. Note : Messaging Configuration for Inventory Application is exactly same as this one, with queue’s being flipped: Order will be received on order-queue and response will be sent to order-response-queue. Rest of the code/setup shown here [For Web-shop Application] is plain spring MVC related stuff. you can find the complete code [for both applications] in the download section. return "Order [orderId=" + orderId + ", productName=" + productName + ", quantity=" + quantity + ", status="
And Finally, the Project structure for Web-shop application is shown below. In order to limit the size of post, code for Inventory Application is not shown here, but available in download section. Build both the applications. Start tomcat and deploy only the Web-shop application for the time-being. Open the browser and visit to http://localhost:8080/Spring4MVCJmsActiveMQExample/. Now go to ActiveMQ webconsole and check the queues on http://localhost:8161/admin/queues.jsp. You will see both the queue’s and an enqueued message on order-queue. Also notice that web-shop application is rgistered as a consumer on order-response-queue [as it is listing on this queue]. On our application side, you can check the order status. It is in created state [because it is not yet processed by Inventory application , we did not deploy it yet]. Now add few more order. 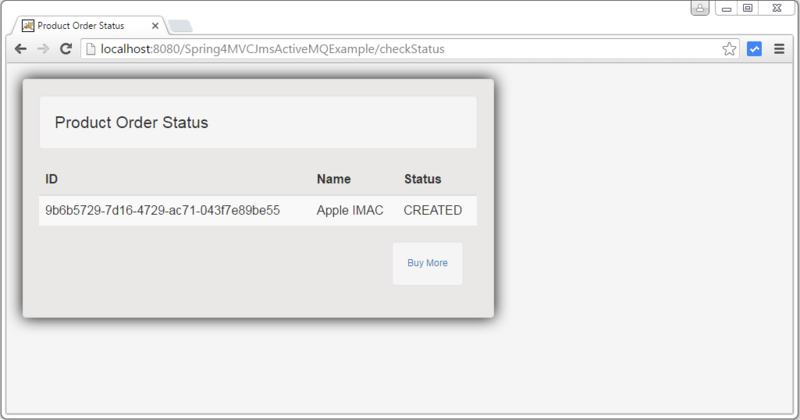 Now deploy the Inventory application in tomcat, and check the Active MQ console for queue’s again. All message should be dequeued [as Inventory applications was listening to order-queue, all message are dequede and processed, and response has been sent back to Web-shop application using order-response-queue. Check the Order status again on Web-shop application. All are confirmed. That’s it. Download both the applications, and play with them locally to learn more. 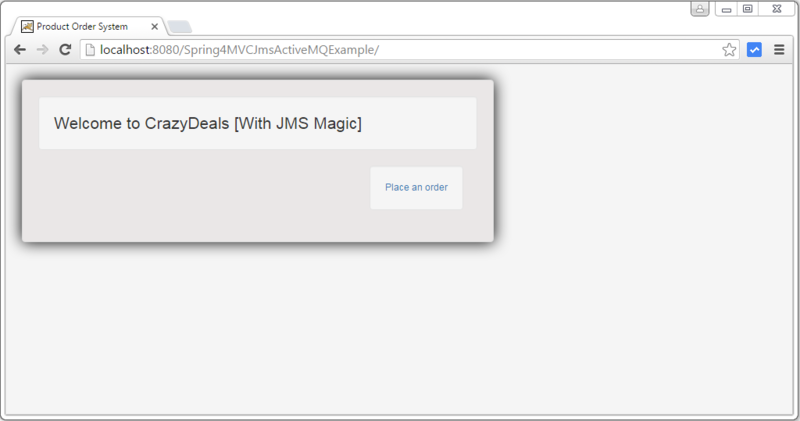 As we saw, SPRING JMS support is easy to use. Feel free to Comment, and suggest improvements.